“The seventy-two came back rejoicing” (Luke 10:17). 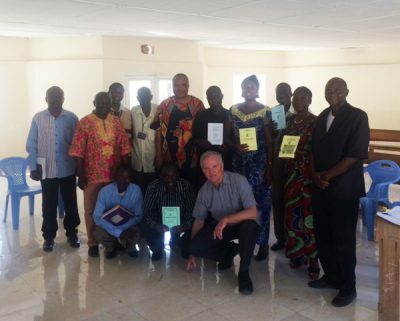 “Came back rejoicing” describes the spirit of the North Katanga Publishing Team when we gathered in Kamina, Democratic Republic of the Congo, in February. They were happy with the results of their work, and so was I. They were able to accomplish big things with what seemed like small investments. They were filled with the joy of knowing by the people’s glad responses that they were meeting real needs and that God was blessing their hard work. I was there when they developed it. It was an ambitious plan. So I was curious how they had done in eight months time. The reports per product came one by one. And to my amazement, they had accomplished nearly everything they had set out to do: a catechism, a book of liturgy and worship, study booklets for women’s ministry, distribution of Bibles, and a professional taping of the famous Kamina choir. All in six months! Moreover, they sold all they had produced. Sure, they price each product affordably in that context, which often means pricing products below real cost because most everyone is poor. That’s in accordance with our aim — to make core resources available and affordable for local church people to obtain. But then, when they sold the first print run, the team promptly reinvested the sales income for each product back into producing more of the same, then selling out and repeating the cycle until all of the money was gone. So they truly maximized on the seed money almost down to the last penny. For example, with a $1000 initial investment, the team bought 100 Bibles — Swahili and Kaluba — at an unaffordable $10 each from the local Bible society. They resold them all for $5 each to people in the churches of various districts, generating $500 net income. They used that $500 to buy 50 more Bibles, which they promptly sold, generating $250 net income. The $250 bought 25 more Bibles, which when sold, generated $125 net income, with which they bought and sold 12 Bibles, resulting in $36 net income. In summary, a $1000 investment became $1,841 in buying power and resulted in the distribution of 187 Bibles to people who needed them.